Georgetown is located in Scott County, Kentucky and is just minutes from the large city of Lexington. Georgetown, while home to some thriving businesses is also a desired residential community. It offers its civic minded residents a safe place to call home and many of the same amenities of its larger neighboring cities, making it a comfortable place for anyone to live! At Action Pest Control we are proud to say that we can offer all the residents of Georgetown with the budget-friendly pest control services that they need to keep their properties safe from pests like ants, spiders, roaches, flies, pantry pest, stinging insects, mosquitoes, and mice who unfortunately, also call Georgetown home. Contact Action Pest Control today to “Take Action and Get Action” against pests! Our highly trained, friendly and experienced pest control experts take pride in providing all of our residential customers with exceptional pest control solutions that are always performed at your convenience. By choosing one of our four year-round pest control programs you will ensure that your Georgetown home will be free of household pests throughout the year. Our most comprehensive year-round pest control option is our Premier pest control program. The Premier home pest control program protects your home from over 40 household pests, including stinging insects within 40 feet of the structure. The Premier home pest control program also includes exterior pest defense and interior pest control services, cobweb removal, rodent control, window sill vacuuming, and many other services, including termite monitoring and termite inspection; all to provide you with the best protection possible against pests in your Georgetown home. To learn more about our Premier home pest control program or our other residential pest control program options, give us a call today! At Action Pest Control we truly understand the pest pressures that Georgetown business owners face. We face pests head-on and provide the customized commercial pest control services you need to protect your company’s goods, facility, customers, employees, and reputation from Kentucky pests. 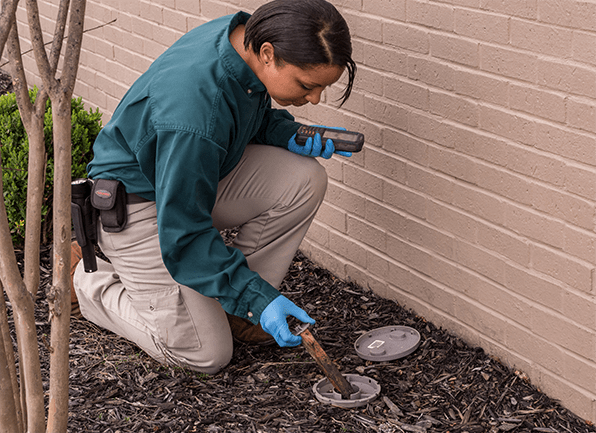 Through our Integrated Pest Management program, we will work closely with you to eliminate any current pest issues; we then get to the bottom of the pest activity in your facility in order to resolve it and help prevent future pest infestations. Our 10-step preventative pest management program includes: inspection, monitoring, identification, sanitation, exclusion, harbor reduction, mechanical controls, environmental controls, product application, and documentation services. Contact us today to learn more about Action’s highly effective commercial pest control services. Instead of wearing lotions and perfumes when spending time outside, wear a bug repellent with DEET. When you are going to be spending the day outside in areas with high mosquito populations keep as much of your skin covered as possible with hats, long sleeves, pants, and closed-toe shoes. It also help to make sure the clothing you are wearing is light in color. Remove standing water around your home. Make sure that gutters are free of leaves, sticks and other debris, store containers that can collect water upside down when not in use, and regularly shake the water off of tarps and trash can lids. Make sure that pools located on your property are being properly cared for and their chemicals are at proper levels. Install outdoor fans on deck or porch areas; mosquitoes are weak flyers and the wind produced by the fans will help to keep them away from you while you while spending time outside. Make sure that screens found in doors and windows are intact to help make sure they can’t get inside of your home. In addition to taking the above steps, putting into place a seasonal mosquito control program from Action Pest Control can help to greatly reduce the number of mosquitoes found breeding and resting on your Georgetown property. Contact us today to learn all the details about our mosquito control program and take back your backyard from mosquitoes! Action Pest Control should be your choice for pest control because we are company that has worked hard to gain the trust of all of the communities that we serve. Action Pest Control has always had one mission: to provide you with timely service and effective solutions from professionals you can trust. At Action we put our customers first by providing guaranteed 24-hour emergency service response, offering the convenience of online payment options, providing superior communication, including written service specifications; and of course by controlling pests through modern, effective, and eco-friendly pest control services. Action Pest Control is a QualityPro certified company; and all of our professionals and pest control programs are overseen by our on-staff board certified entomologists. In addition to offering residential pest control services, commercial pest control services, and mosquito control services, we offer the quality services needed to eliminate bed bugs and termites from Georgetown properties. Give us a call today and discover for yourself why so many Kentucky residents choose to trust Action Pest Control to take care of all their pest control needs!